A few months ago, I wrote up my own RSS feed generators that scraped the AGU in-press pages. 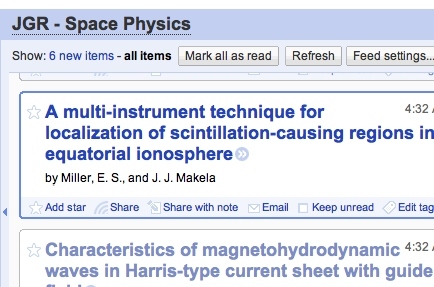 Today, one of my papers appeared in the feed. Surreal. And, gratifying. In other news, my advisor discovered this week that AGU now has their own RSS feeds. Geophysics gone Web 2.0. Previous Entry: Hobby, Passion, Obsession? Previous Entry Hobby, Passion, Obsession?